It's hard to believe we've been doing this for 11 years, but that's a fact. Our first show was at the now demolished Studio 28 in 2005. For 2015 we nodding our caps to Spinal Tap and turning this one up to 11. 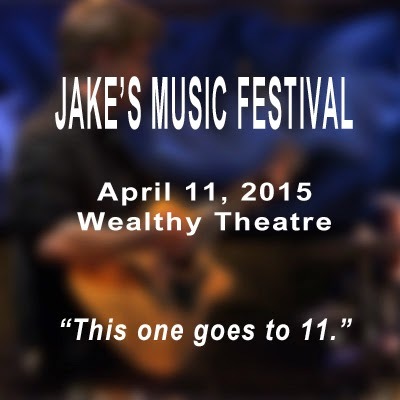 The show takes place on April 11, 2015 at Wealthy Theatre in Grand Rapids. We are still working on the line-up but the show will include Spinal Tap tribute band Sext Farm. (We told you this one goes to 11.) Also appearing will be the PotatoeBabies, Jesse Ray and the Carolina Catfish, Truckstop Cobras, Fathom 19, Otis Blueswell Jr., and JOE. We'll be announcing more bands as we get closer to the show date. As in years past Jake's Music Festival is a FREE concert. We ask that you make a donation to JDRF (Juvenile Diabetes Research Foundation) while you are at the show. We'll also have a silent auction and local craft beer on tap in the concession stand. It's going to be a great night so mark your calendars now.